Do you want access to a library of information on running a successful blog? Do you have specific blogging questions and wish other bloggers would help you? Do you want to network with highly successful bloggers? Do you want other people sharing your posts and promoting your blog? 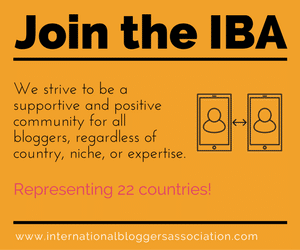 Come join us at the International Bloggers Association. The IBA is all about helping bloggers expand their audience by providing opportunities to share and be shared by other members of our community. It costs nothing to become a certified member. Well nothing, except a promise to help share other bloggers content and share your knowledge. Do you need to share everything every where? Nope. Share what is relevant to your audience. The more you share the more likely others will help share your content. I have been a member for a few months now with That Recipe, and just recently signed up with this blog as I am trying to pump a bit of life back into it. Katy Blevins from Chaos and Kiddos repinned one of my bread recipes and the next day my numbers were double normal for me. Plus I am still getting residual readership from people finding her pin or those that have repinned her repin. Mrs Tee Love Life and Laughter – if nothing else, be sure to follow her social media accounts for bursts of laughter on your news feed. The Crafty Side of Sarcasm – how can you not want to read a blog with a name like that? She Unscripted – an absolutely beautiful blog about languages and photography and life and… I probably never would have stumbled on it if it weren’t for IBA. Brittany’s Blog – I would be remiss if I did not mention the blog by IBA founder Brittany Bullen, which includes blogging advice, life coaching, parenting tips and more. As you can see there are bloggers in all genres plus plenty of room for more. I hope you will come join us for the fun, because when bloggers support each other, everybody wins.